Quite a few presidents have had ties with the state of Illinois. President Abraham Lincoln, most noted for freeing the slaves, lived in Illinois. Also, Ronald Reagan was born in Tampico, IL and raised in Dixon. The 21st President, Ulysses S. Grant, played an important role in the Civil War as General of the Union Army. President Barack Obama, who was a Senator from Illinois, calls Chicago his home. We would be honored were President Obama to use our Illinois auto transport services. Illinois auto transport carriers may drive through Springfield, the Illinois state capital. However, Chicago is its largest and most populated city. Roughly 2.7 million people live there. It is an ultimate location for auto shipping. The city is massive. They do have The L subway train system, but most get around by car. Chicago is also home to the second busiest airport in the world, O’Hare International. Chicago is known for many things and has several nicknames including The Windy City, Chi-Town and Second City. 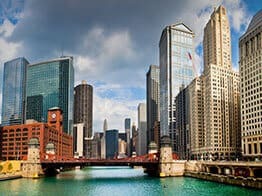 Known for its signature hot dogs and deep dish pizza, Chicago has a lot of history and has become a tourist attraction. There is so much to do in this city. You’ll find numerous theaters, restaurants, parks and shops along the Magnificent Mile. After the Great Chicago Fire in 1871, the city was rebuilt with great architectural design. Today, the Chicago skyline, which overlooks vast Lake Michigan, is among one of the tallest in the world. As auto transport drivers approach the city, skyscrapers can be seen from miles away. You’ve heard that all roads lead to Rome? Well it seems to be true in Chicago too. Meeting in Chicago are I-90, I-80, I-88, I-94, I-55, I-57 and I-65. Wow! That’s a lot of interstates. Chicago is also noted for having historic and victorious sports teams. There are two major baseball teams: The Chicago Cubs (okay, maybe not so victorious, but they wouldn’t be the Cubs if they didn’t break your heart) and the White Sox, who won the World Series in 2005. The Cubs play ball at Wrigley Field, which is the oldest baseball stadium in the National League. The Chicago Bulls had one of the best basketball players of all time, Michael Jordan, who led the team to NBA Championships in 1991, 1992, 1993 and then again in 1996, 1997 and 1998, referred to as the “Repeat of the Three Peat.” The Bulls are also the only team to win 70 plus games in a single season. The Chicago Bears have the most victories in NFL history and the most players to become part of the Pro Football Hall of Fame. Then there is the Chicago Blackhawks, one of the first hockey teams in America. Other things Chicago is known for is the notorious mobster, Al Capone, and hosting the infamous Democratic National Convention in 1968. Whether you are headed to Chicago or to another city in Illinois, our auto transport service can be used to your advantage. You can depend on a quality vehicle shipping service like us to ship your car. If you have questions about vehicle shipping, feel free to contact Direct Express by dialing our toll free number (800-600-3750). Or you can speak to an auto shipping customer service representative about how the system works. You can also visit Direct Express Auto Transport to fill out a simple form and get a free car shipping quote. We make it easy to book your vehicle shipment online.